Offering you a complete choice of products which include steering u joint assembly for automobile industry. 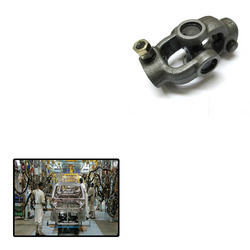 We are an unparalleled name in offering a premium quality range of Steering U Joint Assembly for Automobile Industry. This product is designed and manufactured under the guidance of skilled professionals using the optimum grade component as per the set industry norms. In order to ensure quality, this assembly is tested on various predefined parameters. This product found wide application in variety of steering and shift linkage.